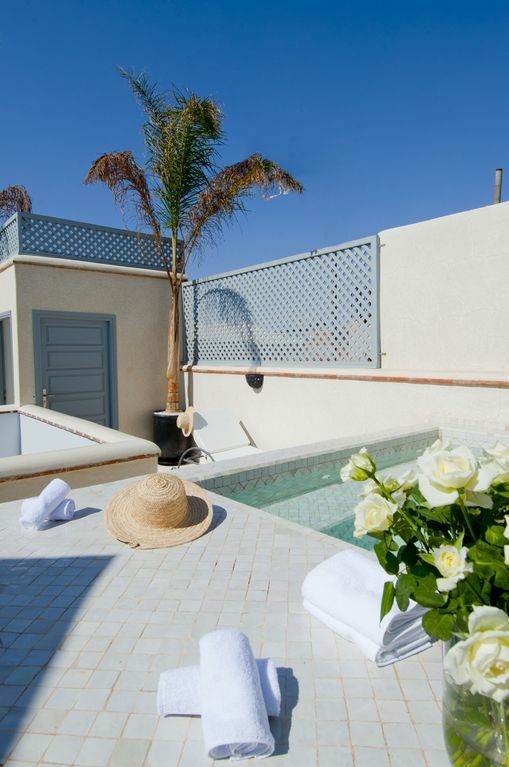 This amazing property in Bab Doukkala is the perfect place to relax in the midst of vibrant and energetic Marrakech. Dar Basyma is in an active neighborhood with people living their daily lives (no tourists here!) it's a great place to blend in. Drop-off by small car or taxi is within feet of this house so you don't have to find your way through a maze to get here. *This is a rare find for that reason alone! * For day / overnight parking, it's about 300 yards away but it's a straight shot and not complicated in the least. Located a few blocks from the gate of Bab Doukkala, the home is in a safe yet typically Moroccan neighborhood, conveniently located to restaurants and shops. The market is a short walk away. Location is absolutely amazing. About 10 minutes walk to Jemaa el Fnaa, the major tourist destination in Marrakech. Also located near the Bab Doukkala mosque and therefore a plentiful market all around. Many high-end restaurants in the neighborhood (and even the Prince of Luxembourg's residence is a few steps away!) make this an ideal location for those who want to experience the non-touristy side of Marrakech while still enjoying what the city has to offer. I work with my business partner, a tour operator, who can plan day trips or longer to the detail for a good price! We offer plans from day trips to a few weeks around Morocco. We have relationships with other properties in Fes, Essaouira, the Sahara Desert, Agadir, and Ouarzazate. So please let us know how we can help plan your trip when inquiring about lodging! We offer meals for an extra fee at the house so when you don't feel like going out, you don't have to! We specialize in traditional Moroccan fare. Lunch / dinner are $20/person for age 10 - adult; children under 10 eat free. Meals generally include a salad, main course, and dessert (generally fruit in season). Menus available at the house. We can also make recommendations for food delivery! The house itself has an open floor plan. You walk into the dining and living rooms with the kitchen overlooking everything. *This is uncommon in Morocco. * Rarely do you find an open kitchen! It's perfect for entertaining and families/groups. There's air conditioning and heat, a small bathroom, as well as a beautiful courtyard along with a kitchen, living room, and dining room on the first floor. Upstairs on the second floor are three en suite bedrooms that are beautiful, each with shower, modern facilities, robes, slippers, and hairdryers. Each room has air conditioning and heating units appropriate for any season. And of course, each room has its own key as well as a safe for your personal belongings. Amenities included: lotion, conditioner, shampoo, and soap. Also a sitting area on the 2nd floor landing to enjoy the quiet and sun. The private terrace on the 3rd floor has palms, an outdoor shower, sitting area with cushioned chairs and low tables, umbrella, two tiled dining tables, and a tiled plunge pool with a newly-constructed wall for privacy that also has a jacuzzi bubble feature. Terrace is large enough to enjoy separate spaces when you want, small enough to be cozy and comfortable. english, I use Google Translate when necessary. I am an American who loves Morocco. After visiting for 3 years, I decided to purchase a place that I could share with others. I work with a tour operator/group to book trips lasting a few days to a few weeks. This team is knowledgable about Morocco and all of her nooks and crannies! You will have an experience unlike a tourist! See Morocco and her people in totally unexpected and personal ways. I have travelled extensively all over the world. You can read about my adventures on my blog, See Jane Travel at janetravelsfar dot com. I'm also on Facebook, Instagram, and Pinterest. This property is gorgeous! It continues to take my breath away each time I enter. The decor is nearly void of color, making it a perfect place to end a busy day. The location of this home is amazing! Perfectly situated in a busy yet easy part of what's called the old medina. No tourists! I like the neighborhood a lot. The house is on a dead end derb (street). Dar Basyma is the first one at the corner. The location of the market is excellent! A very short walk and there's the bakery, butcher, fish monger, grains and legumes - - everything! Maybe the most important feature for me is *convenient location! * With a small car you can drive right up to the place! No meandering through the medina trying to find your home. And parking is just a short walk away in a safe square. The neighborhood is safe and convenient, offering an experience of Morocco not common to typical tourists. The location is convenient and away from tourism. This house is in a typical Moroccan neighborhood with no tourists. There are families and businesses all around the house. If a neighborhood setting does not appeal to you, please do not rent this house! The neighborhood bread baking oven is around the corner! There are craftsmen working in their shops. If you are looking for a touristy spot, this is not it. The team of people working at Dar Basyma are the best of the best. Service is our number one goal. Regarding the space, I especially like how the kitchen is open to the living space - - something not common in Morocco. It's a delightful and peaceful space! And to have a private terrace is a special thing as well. We strive to make your whole experience easy and relaxing. toilet, shower, Window to street; lots of light and air. toilet, Window up high to provide ventilation and light. The house is located in the old Medina yet borders the new city of Guillez. It is also located a bit behind the bus station. The Atlas Mountains may be viewed from Marrakech and the neighborhood on a clear day. Each room has A/C and heat unit. White cotton sheets, duvets, and plenty of pillows! Washing machine on site; housekeeper will do the laundry for you for 100dh / load. Clothes will be dried onsite. Fluffy white towels; pool towels. Sofas and chairs as well as small tables and plush rugs. New refrigerator and freezer. Water / soda available for purchase available in the refrigerator. You can put personal items in the refrigerator, just let our staff know and help you. Wine glasses and ice buckets provided. Tea glasses and tea pots provided. Lunch or dinner at the house is €22 /person for age 8 up; free for children 7 and under. We need 8 hours' notice. Breakfast is included. Lots of guide books available for use whilst at the house. Some basic games are available. Terrace is all outdoors. Umbrella available for shade as well as fabric that stretches over part of sitting area; 2 dining tables, cushioned seating area with low tables, also. Many golf courses nearby. We can arrange for you. The place has 3 floors so people who cannot climb stairs will have difficulty. There is a bathroom on the first floor, but it has no shower. On terrace only; please use ashtrays provided. We work with an established tour company to arrange day trips and longer trips, as you desire. Please arrange with me early on and I can plan your entire trip using people I trust and know. One transfer from / to the Marrakech airport can be arranged for €20, payable directly to the driver, not counting €2 tip. Also included: breakfast and light housekeeping each day. Highly recommended, from the communication by Jane initially, to the amazing staff, the location is close to the Medina and easily walkable to most places. Favourite part was the rooftop to chill after the heat and craziness of the city. Going to miss Hmoda’s breakfasts. I will be back. We’re so happy you enjoyed your visit. You are perfect guests and we welcome you back any time! Next time maybe we take you on a Sahara Desert tour! The place is just amazing, the owner as Well as the staff are just so nice and helpful. The only thing is that thé area is a bit dangerous at night for girls only. If there is a Guy with you there is nothing to worry about. Thanks for your feedback, Zakia! I’ve never heard that it’s dangerous nor have I experienced anything scary, but i appreciate your perspective. We enjoyed having you visit us and hope you come back! We were welcomed by a wonderful team of very helpful , pleasant people who made our first visit to Marrakech so exciting. Our accommodation was ideal, so well furnished and located. We thoroughly enjoyed our stay. We would definitely recommend your home to any visitors. Thanks for your stay! The house team enjoyed every moment you were there! You're welcome at Dar Basyma any time! Our family of 5 had a fabulous stay at Dar Basyma. The housekeeper, cook and guide were so helpful in making our trip a great experience. We could walk to the souks, restaurants and gardens with no trouble. At night we came home to tea and snacks while the most delicious Moroccan dinner cooked. It was a memorable stay! My family and I stayed at Dar Basyma for eight days in December 2016. I highly recommend it! We all agreed - our stay was among the best holidays we have had. Filled with peaceful relaxation, intellectual interest, friends and adventure, in essence, it was a life-affirming trip. Jane, who owns the property, was extremely helpful from the start. She answered my many questions and made special arrangements to accommodate my sister, who was recovering from cancer treatment and needed extra care. She also planned a whole suite of activities for us, along with her business partner Mokhtar, which was tailored to the unique likes of each family member (3 adults and two young men). She went out of her way to ensure we had a perfect stay. Upon our arrival at the airport, we were greeted by Abdul, who works at the home, and his cousin Kahlid, who is a driver. They were both very friendly and welcoming as they delivered us swiftly to Dar Basyma. The residence is located within the walls of the Medina. You enter through one of six ancient gates. In the Medina, there are craftspeople working, shops, children playing, perhaps the occasional donkey cart or moped rolling by, kittens running about, and beautiful doors. Behind each door is a tranquil home. Inside Dar Basyma, the rooms are airy, open and light. There are good quality Berber rugs everywhere. The décor is stylish yet comforting. The rooptop sunshine is heavenly. It is quiet, yet alive and full of positive energy at the same time. Abdul made us tea and biscuits, and we immediately felt at home. Ghizlane, the highly skilled house chef, began making us fragrant chicken tagine with preserved lemon and olives. Night after night, we dined well, kicked back, and it was so good just to be together there. Our family adores Morocco, the stunning landscape, the Berber traditions and art, but most importantly the people we met there were exceptional; we consider them friends for life. Abdul, Mokhtar, Ghizlane, Abdullah, and Khalid treated us with the utmost kindness and hospitality. We were brought to the best shops, museums, historic sites, and cafes in Marrakech, Essoaria, and the Ourika Valley. We had conversation, music and guidance along the way. Navigating Morocco without our lovely friends would not have been the same - they made it easy for us, and they made it fun. I cannot wait for my return trip to Morocco. Next time, I will like to stay at Dar Basyma longer and go to the Sahara with Mokhtar! Planning with Alison was a pleasure from start to finish! What a wonderful person and a great group of people. The house team loved every minute of your stay and we hope you come back and visit! Thanks for loving Morocco so much and for staying at Dar Basyma! The market is around the corner where you can buy everything from meat, vegetables, bread, etc. to souvenirs and basic supplies. A perfect location. You are also very close (about a 1/2 mile) to Jardin de Majorelle, a beautiful garden in the new city. Spectacular place! Also within 20 minutes' walking distance to the Jmaa el Fna "the Place" for snake charmers, storytellers, henna and music! The house is in a neighborhood; no tourism, or very little. You will stay amongst families living their daily lives. There are shoemakers, dressmakers, soup makers, woodworkers, hand painted table and box store - - all with shops within steps of the place! And some of the best bread known in the area is a half block away, along with community bread ovens where everyone bakes their bread! It really is a special location. There are restaurants and spas around the corner. And the taxis stand at the gate, about 500 yards away. It's all very convenient and safe! Prices are FOR THE WHOLE HOUSE. Each room is locked and private. Each room has bathroom w shower. Each room has a safe. Absolutely no smoking on any floor of the house. You may smoke outside the front door. No pets allowed. Breakfast included with room rate as well as transfers to and from the airport. No additional guests are allowed at the house. There are strict laws in Morocco for guesthouse / riad owners: we must get a passport number, name, address for everyone at the house and if there is one Moroccan guest, marriage certificates need to be scanned and recorded. If not, we are at risk of losing our authorization. This is very serious. We have installed cameras in the outside areas of the house in order to protect ourselves from this. I think it's only fair you know this up front.